we thought we would repost a couple of photos from last year about this time, taken on the Marsh Discovery Trail. 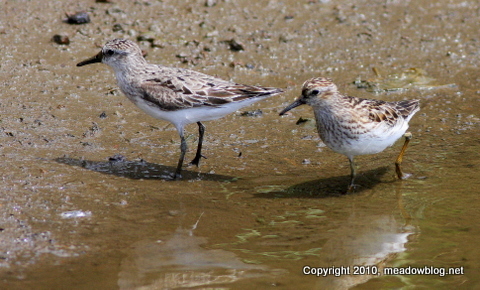 The photo above is of a Semipalmated Sandpiper (left) and a Least Sandpiper (right). 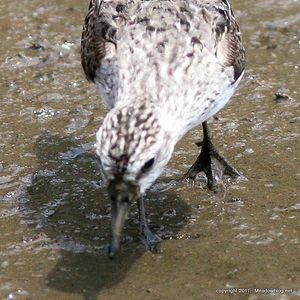 The Semipalm gets its name for its partially webbed (semipalmated) toes. These were taken Aug. 5, 2010. It might just be one of the strangest road signs in America. It’s located at DeKorte Park in Lyndhurst, and it only goes up once or twice a summer. 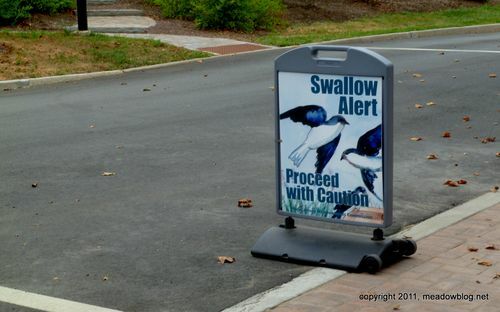 That’s the New Jersey Meadowlands Commission’s way of warning drivers that the swallows are flying low in search of insects, and people should reduce their speed. We also post the sign on the Meadowlands Nature Blog, meadowblog.net, to let readers know in advance of coming to DeKorte. If you are a really savvy naturalist, you know the sign also means you should get out your raingear — but more on that later. Rest of the column follows.